Seems like former New England Patriot star Aaron Hernandez just can’t catch a break. Hernandez is currently serving a life sentence for the 2013 homicide of semi-pro football player, Odin Loyd. Now, he has recently been identified as the shooter in a 2012 drive by that resulted in a double homicide. 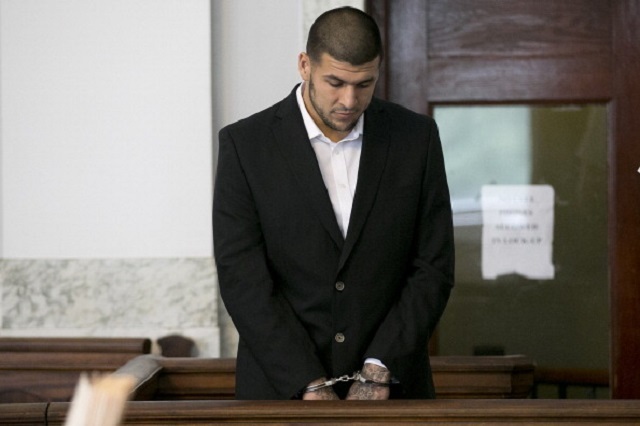 Prosecutors believe that an accidental bump on the dance floor is what set Hernandez off. He allegedly trailed the vehicle and opened fire on three passengers, which left two dead. The lone survivor identified Hernandez as the shooter. Rayside Sanchez testified Tuesday in a pretial giving key details to the final moments of his two friends’ lives. Sanchez claims they were leaving the club listening to music when they reached a stop light. An SUV pulled up alongside of them and yelled “Whats up n***a,” before firing multiple shots into the car. Sanchez was only wounded but the other two passengers weren’t so lucky. The two victims Daniel De Abreau and Safiro Furtado died on the scene. Sanchez, covered in blood, got out of the car and was able to identify the shooter. Sanchez says Furtado, 28, was already dead before EMT’s arrived. He applied pressure to De Abreu’s wounds but ultimately died in his arms. He was only 29 years old. As Sanchez recalled the horrible events, an unidentified woman left the court room crying. Hernandez could be seen laughing and joking with his attorney, who tried to poke holes in Sanchez’s story. In the initial report, Sanchez stated the SUV was white. When recovered, the vehicle from Hernandez’s uncle’s house was silver. The SUV was seized by Police during Loyd’s investigation. Sanchez claims he saw the SUV on the news and recognized it. Jose Baez, Hernandez’s attorney, asked Sanchez what the shooter looked like. He replied “Like Him” nodding his head in the direction of Hernandez. Baes asked Sanchez to clarify who “Him” was and he uttered “Hernandez”. The trial is scheduled for February so stay tuned as we cover this story closely.